Shattered Glass is a 2003 biographical crime drama film written and directed by Billy Ray. The screenplay is based on a September 1998 Vanity Fair article by H. G. Bissinger. In it he chronicled the rapid rise of Stephen Glass's journalistic career at The New Republic during the mid-1990s and his steep fall when his widespread journalistic fraud was exposed. The film, starring Hayden Christensen, Peter Sarsgaard, Chloë Sevigny, Hank Azaria, Melanie Lynskey, and Steve Zahn, premiered at the 2003 Toronto International Film Festival on August 10, 2003 before screening at multiple film festivals, ultimately receiving a North American limited release on November 26, 2003. The film, although not a box office success, was very well received critically with praise going to Christensen and Sarsgaard's performances. Stephen Glass is a reporter at The New Republic, where he has made a name for himself for writing colorful stories. His editor Michael Kelly is revered by the magazine's young staff. When David Keene (at the time Chairman of the American Conservative Union) questions Glass's description of minibars and the drunken antics of Young Republicans at a convention, Kelly backs his reporter when Glass admits to one mistake but says the rest is true. Kelly is fired after he stands up to his boss Marty Peretz on an unrelated personnel issue, and fellow writer Charles "Chuck" Lane is promoted as a replacement. The magazine publishes an entertaining story by Glass titled "Hack Heaven" about Ian Restil, a teenage hacker who was given a lucrative job at software company Jukt Micronics after hacking into its computer system. After the article is published, Forbes Digital Tool reporter Adam Penenberg begins researching the story in order to discover how Glass scooped everyone else; Penenberg is unable to uncover any corroborating evidence for Glass's story. Questioned by the Forbes reporter, Lane becomes suspicious when Glass cannot provide sources for his article and when the few pieces of concrete evidence are discovered to be an amateurish website representing Jukt Micronics and a Palo Alto phone number with only one phone line where every call goes directly to voicemail. Penenberg and his colleague Andy Fox can find no proof Jukt or any of the people mentioned in the story: Restil, Jukt president George Sims, former NBA agent Joe Hiert, and Nevada law enforcement official Jim Ghort even exist. Lane drives Glass to the convention center where the hacker convention supposedly took place. When Lane asks a security guard for help, he learns the convention center was not open that day. Lane also discovers that the restaurant where the hackers supposedly ate dinner afterwards closes in the early afternoon. After haphazardly trying to defend himself, Glass finally "admits" to Lane that he wasn't actually at the hacker convention, but relied on sources for information and pretended he was there to give the article a first-person feel. Lane is outraged, but proceeds cautiously while seeking the truth. He suspends Glass, earning him the enmity of staff reporters who all are fond of Glass. Caitlin Avey is so angered by Lane's actions that she considers quitting. When a fellow staff member calls Lane, expressing concern for Glass's state of mind, he mentions that Glass has a brother living in Palo Alto. Lane realizes the brother must have posed as Sims on the day he returned Lane's phone call. Glass pleads for another chance, but Lane orders him out of the office and takes his security access card. Searching through back issues of The New Republic, Lane realizes that much of Glass's previous work was falsified. When an emotional Glass returns, Lane fires him. Caitlin accuses Lane of wanting to get rid of everyone who was loyal to Kelly, but he challenges her to act like the good reporter she is. He reminds her that half of the falsified stories were published on Kelly's watch after being fact-checked, and that the entire staff will have to apologize to their readers for allowing Glass to continue to hand in fictitious stories. The following day, a receptionist wryly remarks to Lane that all this trouble could have been averted if the stories required photographs, which Lane had argued against putting in the magazine. Lane discovers the staff has written an apology to their readers. They spontaneously applaud their editor, signifying their unity. At a meeting with Lane and a lawyer, Glass tacitly admits that 27 of the 41 articles he wrote for The New Republic were fabricated in whole or in part. An epilogue reveals that Glass decided to complete law school and wrote a novel called The Fabulist about a reporter who fabricates his stories, and that Kelly was killed in Iraq while covering Operation Iraqi Freedom. The film is dedicated to his memory. Producer Craig Baumgarten, working with HBO executive Gaye Hirsch, optioned H.G. Bissinger's Vanity Fair magazine article about Stephen Glass for an HBO original movie. They hired screenwriter Billy Ray based on the script he had written for the TNT film Legalese. Ray grew up with Bob Woodward and Carl Bernstein as his heroes and studied journalism for a year. It was this love for journalism that motivated him to make Shattered Glass. A sudden change in management put the film into turnaround and it remained inactive for two years until Cruise/Wagner Productions bought it from HBO. They took it to Lionsgate and Ray asked the studio if he could direct in addition to writing it. Ray stuck with the project because he knew Bissinger, having previously adapted one of his books, Friday Night Lights. The challenge for Ray was to make the subject matter watchable because, according to the filmmaker, "watching people write is deadly dull ... in a film like this, dialogue is what a character is willing to reveal about himself, and the camera is there to capture everything else". The breakthrough for Ray came when he realized that the film's real protagonist was not Glass but Chuck Lane. According to Ray, "as fascinating as Stephen Glass is by the end of the movie people would want to kill themselves – you just can't follow him all the way". He used the Bissinger article as a starting point, which gave him a line of dialogue on which to hook the entire character of Glass: "Are you mad at me?" According to Ray, "you can build an entire character around that notion, and we did". To prepare for the film, Ray interviewed and re-interviewed key figures for any relevant details. He signed some of them as paid consultants and gave several approval over the script. Early on, he spent a considerable amount of time trying to earn the trust of the people who had worked with Glass and get them to understand that he was going to be objective with the subject matter. The real Michael Kelly was so unhappy about how he was portrayed in Bissinger's article that he threatened to sue when Ray first contacted him about the film and refused for two years to read Ray's script, which he eventually approved. Ray attempted to contact Glass through his lawyers but was unsuccessful. Lionsgate lawyers asked Ray to give them an annotated script where he had to footnote every line of dialogue and every assertion and back them up with corresponding notes. The night before principal photography began in Montreal, Ray screened All the President's Men for the cast and crew. He shot both halves of the film differently – in the first half, he used hand-held cameras in the scenes that took place in the offices of The New Republic, but when the Forbes editors begin to question Glass, the camerawork was more stable. Ray's original cut of the film was a much more straightforward account of events but while editing the film he realized that it was not good enough. He raised additional funds to shoot the high school scenes that bookend the film. On April 3, 2003, a little more than six months before the film was released, Michael Kelly was killed while reporting on the invasion of Iraq. The film is dedicated to his memory. 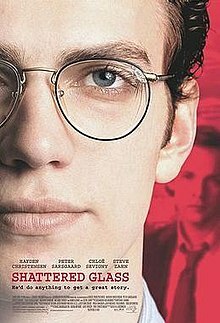 Shattered Glass premiered at the Toronto International Film Festival and was shown at the Telluride Film Festival, the Boston Film Festival, the Woodstock Film Festival, the Mill Valley Film Festival, and the Austin Film Festival before opening on eight screens in New York City and Los Angeles on October 31, 2003. It grossed $77,540 on its opening weekend. It eventually earned $2,220,008 in North America and $724,744 in foreign markets for a total worldwide box office of $2,944,752. The film received positive reviews from critics. On Rotten Tomatoes, the film has a 91% "Certified Fresh" rating, based on 172 reviews, with an average rating of 7.68/10. The site's consensus states: "A compelling look at Stephen Glass' fall from grace." On Metacritic, the film has a score of 73 out of 100, based on 38 critics, indicating "generally favorable reviews". A. O. Scott of The New York Times described the film as "a serious, well-observed examination of the practice of journalism," and "an astute and surprisingly gripping drama." He added, "A more showily ambitious film might have tried to delve into Glass's personal history in search of an explanation for his behavior, or to draw provocative connections between that behavior and the cultural and political climate of the times. Such a movie would also have been conventional, facile and ultimately false. Mr. Ray knows better than to sensationalize a story about the dangers of sensationalism. Shattered Glass is good enough to be true". Roger Ebert of the Chicago Sun-Times gave the film three-and-a-half stars out of four and felt the film was well-cast and "deserves comparison with All the President's Men among movies about journalism". In a dissenting review from The Village Voice, J. Hoberman dismissed the film as "self-important yet insipid," and asks, "Shattered Glass begs a larger question: What sort of culture elevates Glass for his entertainment value, punishes him for being too entertaining, rewards his notoriety, and then resurrects him again as a moral object lesson?" Sarsgaard's performance as Charles Lane was singled out by several critics for praise. USA Today gave the film three-and-a-half stars out of four and wrote of him: "Sarsgaard deserves more credit than he'll probably get for his multi-layered performance". Premiere's Glenn Kenny wrote, "it's Peter Sarsgaard, as the editor who serves Glass his just desserts (sic), who walks away with the picture, metamorphosing his character's stiffness into a moral indignation that's jolting and, finally, invigorating". His performance ended up winning numerous awards, including "Best Supporting Actor" citations from the Boston Society of Film Critics, Kansas City Film Critics Circle, National Society of Film Critics, Online Film Critics Society, San Francisco Film Critics Circle, and the Toronto Film Critics Association, as well as nominations from the Independent Spirit Awards and the Golden Globes. The A.V. Club placed his portrayal of Chuck Lane at number six on a list of the best performances of the decade. Stephen Glass saw the film and, when reflecting about the experience, he said, "It was very painful for me. It was like being on a guided tour of the moments of my life I am most ashamed of". ^ "SHATTERED GLASS (12A)". British Board of Film Classification. March 23, 2004. Retrieved November 27, 2015. ^ "Movie Shattered Glass". The Numbers. Retrieved July 11, 2011. ^ a b "Shattered Glass". Box Office Mojo. 2004-01-29. Retrieved 2011-08-23. ^ Bissinger, Buzz (September 1998). "Shattered Glass". Vanity Fair. Retrieved 2011-08-23. ^ a b "Shattered Glass (2003)". Rotten Tomatoes. Flixster. Retrieved December 26, 2010. ^ a b c d e f Bowen, Peter (Fall 2003). "Confirm or Deny". Filmmaker magazine. Retrieved 2009-08-13. ^ a b c d e Carr, David (October 19, 2003). "Film: Authors of Their Own Demise; The Real Star of Stephen Glass's Movie". The New York Times. Retrieved 2009-08-13. ^ a b Bear, Liz (October 28, 2003). "Journalist as the Bad Guy". Indiewire. Retrieved 2009-08-13. ^ P, Ken (March 24, 2004). "Interview: Billy Ray". IGN. Retrieved 2009-08-13. ^ a b Horgan, Richard (October 22, 2003). "Glass Shards". FilmStew. Archived from the original on June 6, 2011. Retrieved 2009-08-13. ^ "Shattered Glass reviews". Metacritic. CBS Interactive. Retrieved December 26, 2010. ^ Scott, A.O. (October 31, 2003). "A Young Writer's Ambition, With Loyalty and Betrayal". The New York Times. Retrieved 2009-06-12. ^ Ebert, Roger (November 7, 2003). "Shattered Glass". Chicago Sun-Times. Retrieved 2009-06-12. ^ Hoberman, J (October 28, 2003). "Telling Lies in America". The Village Voice. Retrieved 2009-06-12. ^ Clark, Mike (October 30, 2003). "'Glass' puts the pieces together". USA Today. Retrieved 2009-06-12. ^ Kenny, Glenn (October 29, 2003). "Shattered Glass". Premiere. Archived from the original on January 31, 2010. Retrieved 2009-06-12. ^ Murray, Noel; et al. (December 1, 2009). "The best film performances of the '00s". The A.V. Club. Retrieved 2009-01-06. This page was last edited on 17 March 2019, at 00:05 (UTC).